Welcome to the Sixth Wave of the American Counterculture! In times like these, with a solidly Republican national government resulting from the 2016 presidential election, plus more state governments turning Republican, it is clear that advancing and even holding steady on progressive causes in America is soon to become much more difficult. During times like these, with protests in the streets against a new president who is not yet in power, many people begin looking for alternatives. Talk about moving out of the country suggests that Canada might be a viable destination, except that American citizens cannot get jobs there, so only the well-off can pull-off that rescue. Meanwhile, to many others, times like these result in the American counterculture entering a new period of enthusiasm, growth, and influence in the dominant culture. Welcome to the sixth resurgence of the Fourth World, the American counterculture existing within the dominant First World culture! Accompanying this article is a graphic intended to represent the political-economic theory of the parallel cultures of the First and Fourth Worlds. Use of the Taoist Taijitu or “yin-yang” symbol to diagram the two opposing yet intertwined economic systems of taking and exchanging versus gifting and sharing serves to emphasize the interdependence of debt-based monetary and non-monetary time-based economic systems. Both are needed, and while the monetary system gets most of the attention in the First World, the time-based economies at the level of the family and community nurtures children and adults through unpaid household labor for engagement in the dominant culture’s monetary system. The processes of mutual aid in the family and community represented by the rainbow rings, show how people are able to push the monetary system out of our lives, to various degrees. 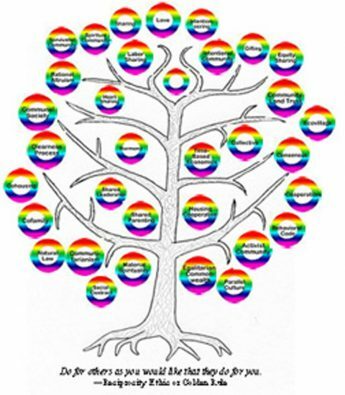 Each of the rainbow rings is labeled with a different communitarian value or structure, of which “rational altruism” and “communal society” are the most successful in creating the non-monetary, parallel culture. The use of the term “parallel cultures” emphasizes the concept of two symbiotic cultures in a dynamic system, much like the concept of “opposites attract.” Emphasizing the synergistic aspects of opposing economic paradigms serves to retire the Marxist communist concept that someday the counterculture of solidarity, called by Marxists the “dictatorship of the proletariat,” will replace the dominant culture’s drive toward the dictatorship of the plutocracy. While progressive causes are on a long trajectory toward parity with the conservative paradigm, replacing one paradigm entirely with its opposite only replaces one form of extremism with another, when the goal of economic stability and sustainability requires a balance of opposing paradigms. It is partly to refuse Marxist communist theory and to distance the Fourth World from it that The School of Intentioneering was created to advocate the use of new terminology like “intentioneering” in place of the term “communitarianism,” and to develop theories on balancing the opposing paradigms in the concept of “parallel cultures.” The School of Intentioneering advocates the replacement of both Marxist authoritarianism and anarchist anti-statism with advocacy for the local self-determination of gifting and sharing cultures for reducing their reliance upon or exposure to monetary economics, within a global culture dominated by the monetary economic system. In response to the Marxist concepts of “scientific socialism” versus “utopian socialism,” The School of Intentioneering offers a history of the rise of civilization emphasizing that the counterculture exists in parallel with the dominant culture, the two learning from and benefiting from each other over time toward a form of human civilization that will hopefully be more stable and sustainable. This new history and future projections was published in May, 2016 with the title The Intentioneer’s Bible, currently available only in digital format on Amazon.com. While there are many terms in use for representing the two political-economic systems of the dominant and the alternative cultures, the most explanatory are “First World” and “Fourth World.” The political-economic term “First World” refers to market-based economies, while the “Second World” are state-controlled economies found in communist countries. The familiar “Third World” are the countries developing toward one of the first two, while the “Fourth World” are small countries or subcultures within any of the first three that are happy with their locally-controlled political-economic forms and are not trying to become like any of the other three. Along with the various forms of intentional community and many other cultural alternatives, the Fourth World includes indigenous cultures refusing assimilation by the dominant, First World culture. There is a natural affinity between tribal cultures everywhere in the world with the counterculture, as both seek to be outside of the dominant culture’s monetary greed and avarice. Native Americans and those who deliberately leave the dominant First World culture for the Fourth World are therefore natural allies, as can be seen during periodic times of collaboration between the two, such as what is happening in North Dakota with the Seven Council Fires of the Sioux inviting its Fourth World allies to aid its blockade of an oil pipeline. Many of us in America’s counterculture or parallel culture have understood that times of progress toward economic justice and a more complete political enfranchisement comes and goes in cycles. For many of us in the intentional communities wing of the counterculture, formerly called “communitarians,” now named by the present author “intentioneers,” much of our work has been pursued with the thought that gifting and sharing in community is the answer to most if not all of the world’s problems. We watched the cooling of American radicalism of the 1960s and ‘70s become the ‘80s “Big Chill,” knowing that eventually the course of human events would bring another time of tribulations, and the response of popular organizing for local self-reliance, sharing, and solidarity. While some progressive changes have occurred since the 1970s, such as legal marijuana, same-gender marriage, and women training for combat in the military, many problems remain and have become worse. We knew at the time of the first Earth Day in 1970 that the increasing human population growth-rate on the planet is not sustainable, that we were entering a time of species extinction, and that a host of problems would result from global warming, a view that has finally been generally accepted. Anticipating an eventual return of hard times, many people in the communities movement, that is, many intentioneers, have focused upon developing resources through the last four decades or so to help others find and build community for themselves, their family and friends. Now after the economic disaster of the Great Recession and the political reversal of the Republican wins of 2016, the intentional communities wing of the American counterculture is ready to support people in building locally the kind of lifestyle that many people most want to enjoy—the communitarian culture of gifting and sharing! There are now several different models for how people can live in peace and harmony through mutual aid, pushing the monetary system out of our lives through adopting alternative economic systems of gifting and sharing. These models include the various types of intentional community with which many people may already be familiar, specifically: housing cooperatives, cohousing, and other forms of collectivism sharing privately-owned property with labor-gifting; monastery, ashram, egalitarian society, and other forms of communalism sharing commonly-owned property with labor-sharing; and mixtures of common and of private property in the community land trust and other economically-diverse communities, such as those having a communal core-group from whom the non-communal members of the community rent their living space. In addition there are also forms of intentional community that can have any kind of structure, whether collective, communal, or economically-diverse. These are ecovillages, which are any size group of people living together with ecological sustainability as their primary commonality, and cofamilies, which are small groups of three-to-nine people who may adopt any type of gifting or sharing system with or without agreement on a common affinity or a formal political-economic structure. Ecovillages and cofamilies may be happy to carry on with no formal structure for their small group, or may be on their way to becoming one of the more specific political-economic models of intentional community listed above. There have been five prior waves of communitarian enthusiasm in North America, with the first beginning in the 1600s and 1700s involving Protestant religious groups including the German/Swiss Pietists and English Separatists. The second wave landed in the 1840s with both religious and non-religious communities such as the Anarchist Socialist, Associationist, Christian Socialist, Mutualist Cooperative, Owenites, Icarians, and Perfectionsts. The third wave of New World communitarianism crested in the 1890s after a succession of economic recessions or short depressions, fifty years after the second wave. The Hutterites, Mennonites and Amish had begun arriving in the 1870s, and the ’90s saw many other religious, socialist, and anarchist communities, and the first New Towns and Georgist single-tax colonies. The fourth wave came forty years later with the Great Depression of the 1930s and the New Deal government-sponsored Green Belt towns, the Catholic Worker, and the first Emissary communities. The fifth wave hit in the 1960s and ’70s as a massive Baby-Boom-inspired cultural revolution, this time just thirty years later. The sixth wave has broken the pattern of ever shortening interludes between movements, with this current resurgence beginning forty years later. For details on these historical communitarian movements see the Amazon ebook by the present author titled: The Intentioneer’s Bible. Second, the Cohousing Association of the U.S. recently announced a “500 Communities” project, involving the training of developers, architects, builders, bankers and other financiers in the values, procedures and design parameters for creating a specific form of intentional community, which they often call the “intentional neighborhood.” This is very exciting as it shows that all of the functions of standard real estate development can and are working for the counterculture! The cohousing wing of the counterculture in some cases even uses gentrification in replacing the ongoing loss of older circumstantial neighborhood communities with intentional community. Much of the 500 Communities initiative involves an emphasis upon senior cohousing, in addition to the original focus of cohousing upon creating safe and nurturing community for children in inter-generational communities. Third, the communal network called the Federation of Egalitarian Community’s (FEC) is engaged in a project of seeding new urban communal groups in East Coast cities. This has resulted in the March, 2016 FEC Assembly admitting more new communities at one meeting than ever before, nearly doubling the number of FEC-identified communities. Of course the new groups are much smaller than the established communities. While the Federation’s track record for helping new communities survive is not good, the FEC is able to do more now to help new communities than it could in the past due to its continued growth. Fifth, the ecovillage movement appears to be continually growing around the world. While the various ecovillage network websites do not seem to keep track of the number of ecovillages in existence, the Fellowship for Intentional Community reported in its 2010 Directory that the number of communities that adopted the identity of “ecovillage” increased from seven percent in the 2007 Directory to 32 percent in the 2010 Directory (page 12). Much of this increase, however, could be coming from existing intentional communities adopting the ecovillage identity, rather than from new ecovillages being formed. And for young adults desiring a community in which to raise children, who may not be able to afford middle-class cohousing community, there is the term offered by the current author: “cofamily.” Cofamily community is a take-off from “cohousing,” with cofamily being everything that cohousing is not, particularly the design of having an overt, shared spiritual, religious, ethnic, cultural, or other identity among a small number of people. A cofamily is comprised of three-to-nine unrelated adults, with or without children. In some cases a cofamily may be specifically created to support single-parents and their child or children, as a way for friends to support single women having children who may otherwise choose abortion. When raising children in community is the reason for the community, the cofamily may disband once the children reach adulthood. There are many roles that communitarian movements play, usually arising to address some anguish of the age, often the result of natural catastrophes, at times caused by foreign influences, and sometimes caused by the dominant culture oppressing its counterculture. In response, communitarianism, renamed by the present author “intentioneering,” is the peaceful way to create change. This is an historical tradition that addresses many of the same anti-dominant-culture sentiments that some religious fundamentalists are expressing, yet in the communities movement this is done peacefully. The communitarian movement can have a voice in many of the issues of these times, because as a gifting and sharing world-view supporting a cooperative cultural paradigm, intentional communities have a distinctly unique perspective. Being more publicly vocal with what the contemporary communities movements have to offer to the dominant culture would include an initiative designed to help steer youth away from violent ideologies to a peaceful, caring, and nurturing lifestyle. One method for bringing people from hateful and murderous ideologies to communitarianism is to place an emphasis upon the gifting and sharing of things, including labor as well as money or income. Non-monetary economics involves using time-based economics in place of monetary economics, and for many people just knowing that they have the option to live such a lifestyle, without violence, can be inspirational! This announcement of the rising sixth wave of the parallel or counterculture begins a series of articles to be published in a book sometime in 2017, to be titled Intentioneers and Illuminati. This forthcoming book is based upon, and offers theories and analysis derived from, the 2016 book The Intentioneer’s Bible, both by the present author. The next several articles will present the idea of the “cofamily,” followed by articles on the coming 2027 bi-centennial of the anti-Marxist concept of class harmony called “socialism.” These will be followed by additional articles on topics including the “Fellowship Allegory,” “Economics of the Golden Rule,” and “Communitarian Mysticism.” All will be posted with The School of Intentioneering’s graphic representing Parallel Cultures.